IMO 2020 ANALYSIS: Do the Sky High Predictions for Post 2020 HSFO Demand, Scrubber Uptake Add Up? 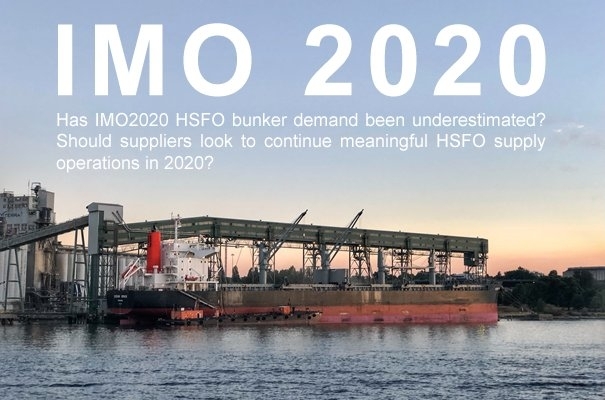 Until recently, the bunker demand picture heading into IMO 2020 was thought to be well understood: When the 0.50% sulfur cap on marine fuel goes into force on January 1, 2020 the vast majority of the 60,000-strong world fleet was expected to switch away from HSFO and burn a compliant distillate or VLSFO blend. While CE Delft, in the official IMO Fuel Availability Report, predicted in 2020 some 3,800 vessels would be operating with scrubbers enabling them to continue burning otherwise noncompliant HSFO, for the most part the technology was being shunned by owners and it was difficult to see even 1,000 ships using them. The end of the HSFO era was upon us. When Dr Vis, writing for Ship & Bunker in May, predicted there would be a surge of interest in scrubber technology akin to a stampede of wildebeest in Serengeti Park, many struggled to believe it. But that is exactly what has happened. At least according to the media. Hype aside, this has led to some fairly drastic revisions of both scrubber uptake and HSFO demand. Add in the wildcard of noncompliance and some say as much as 50% of the current HSFO demand could be retained in 2020. So, has 2020's HSFO demand been underestimated? Should suppliers look to continue meaningful HSFO supply operations in 2020? Or is this all just a pipe dream based on media hype? Ship & Bunker investigates. In IMO's official Fuel Availability Report conducted by CE Delft in 2016, the consultancy saw a base case of 3,800 ships with scrubbers in 2020 using 36 million tonnes of fuel, or about 0.61 million bpd. Who Are the Key Voices Now Seeing Significant HFO Demand in 2020 and What are They Saying? 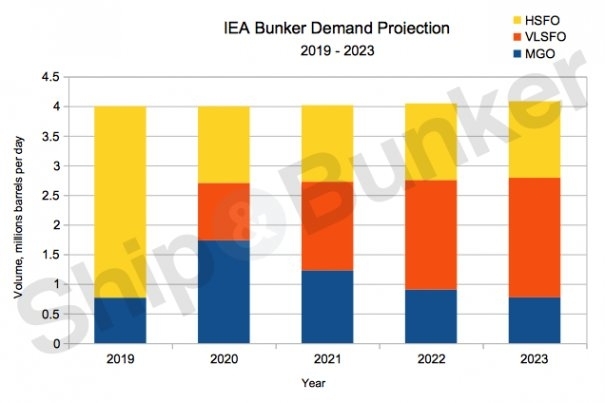 In its recent annual report, IEA predicts bunker demand from 2019 through 2023 at around 4 mb/d. In 2019, it sees HSFO accounting for 80% of that at 3.2 mb/d. In 2020, HSFO demand is seen falling to 32% of the total demand, or 1.29 mb/d, and staying flat at that level out to 2023. VLFO and MGO combined will account for the balance, with IEA predicting VLSFO (with nonexistent demand in 2019) will take a 24% share of the market in 2020, growing to 49% of total demand in 2023. In this time MGO's share of the market will contract as a result, from more than doubling its 2019 share to be 43% of total demand in 2020, before drifting down to 19% of the total in 2023. Earlier this month, Goldman Sachs analysts predicted in 2020 scrubber-equipped vessels will create 1.05 mb/d of HSFO demand. There will also be 0.65 mb/d of HSFO demand from noncompliance, they say, for a combined 1.7 mb/d of HSFO demand in 2020. That is less than a 50% drop from the 3.30 mb/d it pegs 2017's total HSFO bunker demand to be. The investment bank also estimates total bunker sales in 2017 to be 3.5 mb/d. Goldman is forecasting 3,125 marine scrubber installations by 2020. 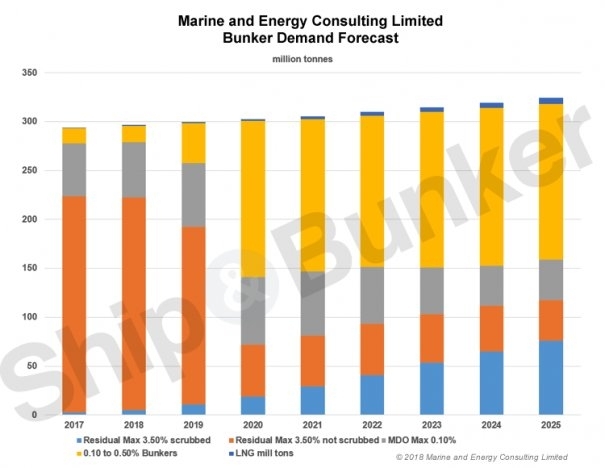 After writing on the matter for Ship & Bunker in August, Robin Meech of Marine and Energy Consulting Limited, says MECL's latest estimates of bunker demand sees residual bunker consumption in 2020 at 70 million tonnes, or 1.2 million bpd. Meech predicts an average of 2,620 vessels with scrubbers in operation during 2020. Can You Count on the Scrubber Count? There have been a lot of headlines hailing the recent surge in scrubber orders. A survey conducted earlier this year by the Exhaust Gas Cleaning Systems Association (EGCSA) said as of May 31, 2018 there were 983 vessels with scrubber systems installed or on order, translating into 1,561 individual scrubber towers. At the end of August Clarkson Research put its scrubber count "north of 1,000 vessels but this probably underplays the latest position." Both these figures are much higher than the 240 scrubber equipped vessels Clarkson's recorded as at December 1, 2017. While these numbers confirm the recent uptick in orders, it doesn't necessarily tell us anything about the impact on big picture HSFO demand because different ships have drastically different rates of bunker consumption. Looking at the forecasts, Goldman predicts similar HSFO demand to MECL but seems more scrubber equipped vessels in operation to achieve that. At the same time, Goldman sees fewer scrubbers in use for 2020 than CE Delft's original estimate, but Goldman's prediction for HSFO demand from scrubber equipped vessels is some 70% higher than CE Delft's. The variations are explained by differing views on specifically which vessels will operate with scrubbers. Goldman sees the bulk of scrubbers being fitted on larger vessels and as "fuel consumption is concentrated among larger ships, we believe the number of scrubbers on order understates the size of the market for high-sulfur fuel oil." It is difficult to independently verify whether scrubbers really are going on the global fleet's biggest burners. Unfortunately, EGCSA confirmed to Ship & Bunker that for its recent survey it did not record the size of the engines or other vessel particulars associated with the installs to enable an inferred bunker consumption to be calculated. While some ships have multiple scrubber towers, Goldman sees the vast majority of scrubber equipped vessels being single tower installs. So assuming a best case for its prediction of 3,125 scrubbers also being a vessel count, Goldman is saying 5.2% of the global fleet of 60,000 will have scrubbers in 2020, or 6.3% if you believe the size of the global fleet impacted by the IMO 2020 rule is closer to 50,000. Can this number of scrubbed vessels produce an HSFO demand equivalent to ~30% of total bunker demand? In a 2017 presentation by Justin Longhurst, Marine Fuels Supply and Trading Manager at BP, quoting 2015 numbers he indicated 6% of the world fleet account for 30% of demand, while a third of ships account for 70% of demand. Goldman slices the consumption numbers differently to BP, saying the top 15% of the fleet accounts for nearly 50% of overall fuel demand. A key factor bumping up overall HSFO demand numbers will be non-compliance. Meech sees compliance levels in 2020 at around 77%, Goldman at 80%. But again, this alone doesn't tell us much about the impact on HSFO demand because a lot of individual vessels could be noncompliant and it won't necessarily add up to a meaningful volume of HSFO demand. Majority thinking at present is that noncompliance will be very low in terms of its impact on bunker demand. There are also three different types of noncompliance; willful, accidental and lawful noncompliance. Not all have the same likelihood of occurrence, nor will they have the same impact on HSFO demand. This is where a vessel operator makes a conscious decision to be noncompliant. Stifel's Ben Nolan is one of several prominent voices who believes willful noncompliance is unlikely to make a difference in terms of overall bunker demand. The big ships, the biggest consumers, are seen as being compliant. "Willful noncompliance will be around 5% of demand," Nolan told Ship & Bunker. "The big bunker consumers are concentrated among a smaller group of holders like Maersk and public companies that cannot afford the risk of bad press for being noncompliant. Plus, their customers, the Ikea's, Nike's, Walmart's of this world, along with their banks, they will all demand that they be in compliance because they too don't want the bad press. And because of the various shipping alliances even the smaller players will have follow suit, they're not going to risk being kicked out of the alliance." NSI's Paul Hardy is another who sees willful noncompliance being low. He pegs the overall non-compliance picture at 10%. "The audit trail of compliant vs non-compliant fuel will be easy to spot due to price differentials. In addition, enforcement will quickly begin to scrutinise vessels that have been trading to ports where there may be a higher possibility of non-compliance," he says. This is where a vessel buys compliant fuel, or at least intends too, but for any one of a variety of reasons tests over the 0.50% sulfur limit at the engine inlet. Meech sees it as unavoidable that there will be high levels of accidental noncompliance in 2020 due to the looming tank cleaning problem. That is, while the majority of vessels will buy and burn compliant fuel they will likely not be able to properly flush their tanks and fuel systems in time for the January 1, 2020 start date. With 0.50% sulfur products expected to be blended very close to the 0.50%S limit (and why wouldn't they?) any remaining HSFO onboard will tip these vessels over the compliance limit. But while industry estimates vary on how widespread this phenomenon will be, it shouldn't matter in terms of the HSFO demand picture. After all, if it is accidental then by implication the ship has not lifted and burned HSFO. Lawful noncompliance is where permission is given to burn high sulfur fuel and typically involves the vessel saying it was unable to purchase compliant fuel at a given port. If such a situation is deemed valid by authorities it is granted a waiver (via a fuel oil non-availability report, or FONAR) to buy and burn noncompliant fuel for the next voyage leg. It is thought that this system could be open to malpractice. Indeed, it has been previously suggested that shenanigans regarding FONARs and fuel regs is already taking place, and that emissions control area (ECA) regulations are being flouted through the misuse of FONARs. For example, an investigation by Ship & Bunker in 2017 found that in Canada, since its ECA came into force in 2012, on average a vessel was granted such a waiver on a weekly basis after saying it was unable to find compliant fuel. Suppliers have suggested that this frequency does not match the reality of supply. So what if come 2020 some ports just carry on selling HSFO and that's the only option for buyers to lift? It is a lot less clear whether the freight buyers, or authorities, would be OK with this. "There must be some acknowledgement of the risk that FONARS could actually be used to attract business and volume to a port. In theory, the owner would be able to then lift and burn HSFO without penalty," says NSI's Hardy. "There are many jurisdictions without refinery capacity and suppliers will be reliant on importing compliant fuel. If such fuel is not available for them to purchase could the FONAR system become crucial?" It is worth noting that most ports today supply MGO, and vessels will not be able to claim for non-availability of 0.50% sulfur product if there are 0.10% sulfur products available. Another form of lawful noncompliance could involve ships receiving long-term waivers to operate out of compliance while they, for example, implement a programme to become complaint via some grander method such as switching to burn LNG. We saw instances of this occur for the switch to a 0.10% sulfur cap in ECAs. While such cases are generally seen as negligible in global demand terms, there are plausible edge cases. "Could Trump decide the IMO 2020 rule unfairly penalizes America and grants a waiver to all Jones Act vessels? It wouldn't surprise me," one Ship & Bunker reader has speculated. Do the HSFO Demand Numbers Add Up? Being mindful that there are significant assumptions and margins of error in everyone's numbers, Goldman's prediction of 3,125 scrubber equipped vessels producing around 1.05 mbp/d of HSFO demand, or 30% of the overall bunker demand, seems doable on paper based on both its own vessel consumption numbers and those of BP. Another way to look at the scrubbed HSFO demand is the ~1.0 to ~1.3 mbp/d predicted by Goldman and IEA respectively is the equivalent of 160,000 to 200,000 mt/day. For 3,125 ships to meet that demand they would need to burn a per vessel average of 51 to 62 mt/day over a year. If we account for those ships making 250 sailing days per year, that puts consumption to an average of 75-90 mt/day when underway. This is not beyond the realms of possibility, particularly if you buy into the idea of scrubbers being used on the thirstiest of vessels. With willful and accidental noncompliance likely a non-factor for HSFO demand as discussed above, the question is, how big of a bump could it get from FONARs? In reality, probably not much. Headwinds for this forecast are numerous, and include the requirement for a lot of scrubbers to be quickly fitted to some very big ships. In terms of vessel size requirement, while we don't know all the ships that do have scrubbers, we do know a lot of big ships will not have scrubbers in 2020. For example, Mega-boxship owner Maersk, who Nolan recently pegged at accounting for 2% to 3% of world bunker demand, has taken a very strong stance on using compliant fuel. Whether the 3,125 scrubber count number is achievable is also in doubt. Many see factors such as installation capacity being a bottleneck regardless of whether enough units could be made. For the record, Goldman sees few barriers to this target being met, with plenty of yard space in China to do the installation work and new / start-ups filling any shortfall in supply - scrubbers are not technologically complicated, the analysts also reason. Worth noting, though, that even skeptics see this level of uptake as within the realms of reality. 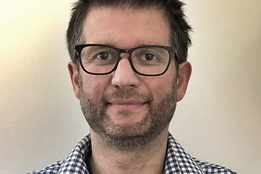 For example, BIMCO recently quoted James Forsdyke, Hong Kong and Taiwan Area Manager for Marine and Offshore at Lloyd's Register, as seeing that a maximum of 3,000 scrubbers could be installed by 2020 - albeit only "if every single dry dock fills up with ships now, and starts fitting scrubbers non-stop until 2020." Even if the ~3,000 scrubber equipped vessel count figure is hit and the units are installed on sufficiently large enough vessels, the next hurdle for HSFO demand is that those ships then need to go to ports where there is HSFO available for them to lift. Given the reality of where such large ships will trade, it is reasonable to expect they will indeed get the required bunkers, rather than being forced to lift a more expensive compliant product. Harder to answer is that it also needs the scrubbers to be working, and the crew to know how to operate them. HSFO demand is also going to be driven by noncompliance, but with willful and accidental noncompliance likely a non-factor for HSFO demand as discussed above, the question is, how big of a bump could it get from FONARs? In reality, probably not much. The vast majority of bunkers are lifted in just a handful of major ports, and especially given IMO 2020 is now on the radar of the world's wider business media, it seems difficult to believe these ports would genuinely not have compliant product or that their port authorities would tolerate FONAR misuse. As at September, major industry stakeholders such as Maersk still see 90% of the global fleet relying on compliant fuels for IMO 2020. What the above suggests is that this is not necessarily at odds with the HSFO demand predictions of Goldman, IEA, and Meech. The HSFO demand predictions from scrubber equipped vessels also seems achievable from ~3,000 vessels as predicted by Goldman, at least on paper. Given today there are ~1,000 scrubber equipped vessels, it is open to debate whether the appetite and ability is there to add another 2,000 to that. What we can also conclude is that the scrubber count is indeed an important barometer of HSFO demand, but only if we also understand the bunker consumption of the vessels they are being installed on. In recent weeks, I've discussed the HSFO demand numbers with a lot of people, and at one end of the scale a source at a major bunker supplier told me there is "absolutely no chance" the scrubber and HSFO demand numbers recently envisaged by Goldman et al will happen. Others tell me that even if it doesn't hit those same highs, they are starting to believe that in 2020 there will be a healthy HSFO market. Between these extremes is a middle ground the likes of 20|20 Marine Energy's Adrian Tolson sees as more likely to emerge. "There's no doubt the scrubber numbers are going to be higher that what were envisaged at the start of this year, but I find more and more skepticism on the very high level of scrubber uptake recently predicted by some," says Tolson. "I see 3-4% of the global fleet with scrubbers in 2020 as more likely, and it is also becoming clearer that not all these scrubbers are on the gas-guzzlers. So I think a 50 mt/day average consumption for scrubber equipped vessels in 2020 is more likely, which for 250 sailing days a year is 12,500 mt per year. If 3.5% of the global fleet of 60,000 get scrubbers then this is 26.25 million mt per year of HSFO, or about 9% total demand." Critical to this whole picture is the price of oil. There were similar levels of angst and hand-wringing over the anticipated jump in bunker costs heading into 2015 for the 0.10% sulfur cap in ECAs. But as we know, the price of oil collapsed at the end of 2014 and the whole thing became a non-issue. The same could happen for 2020. No-one can predict the future, and if nothing else what the above shows is that the promise of some decent HSFO demand in 2020 is no longer just a pipe dream. With 15 months to go, at this stage it would be difficult to criticize any suppliers looking to take a punt on that as they stand to make handsome margins if they're right. Time will tell whether 2020's IP Week is notable for some particularly lavish parties, or the absence of a few familiar faces. Ship & Bunker is the world's most read publication focused on the marine fuel markets. Completely independent, it is the leading industry authority providing comprehensive daily news, exclusive in-depth features and analysis, along with daily & historical bunker price indications. Martyn is CEO of Big Ranch Media and the Editor of their in-house publication, Ship & Bunker, the world’s most read marine fuel-focused publication. With a career building information systems and online publishing spanning over 20 years, he has been providing critical information to the bunker industry since 2002.